Today we had quite a few students graduating. We had a total of 11 students graduating. A few of them sadly missed the Graduation process and left us earlier this week. 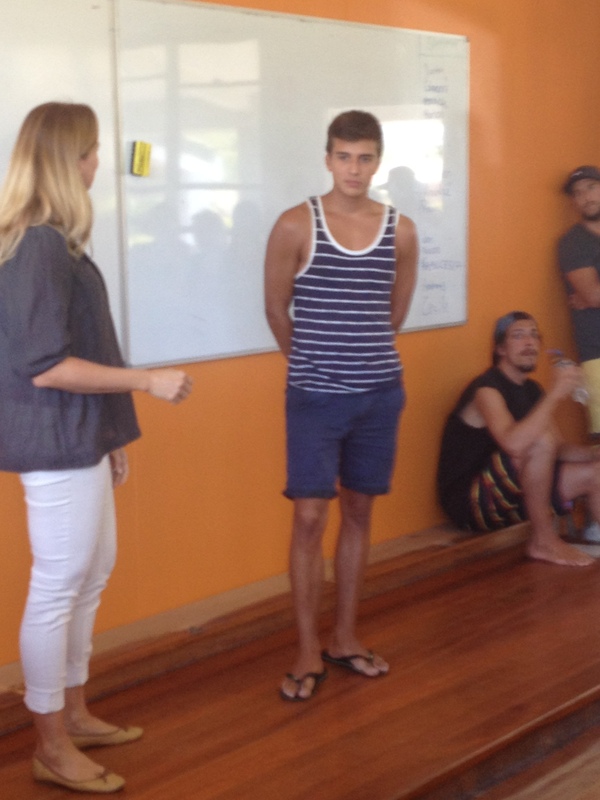 Those students included Anna from Brazil,Matheus from Brazil, Sae from Japan, and Adriana from Brazil. First to graduate to was a group of three from Josie’s class. Jeannine, Sullivan and Vitus. Their teacher said they were a pleasure to have in class and part of such a fun group of students. And all got great marks. During their farewell they said thank you to all their friends and classmates and teachers. 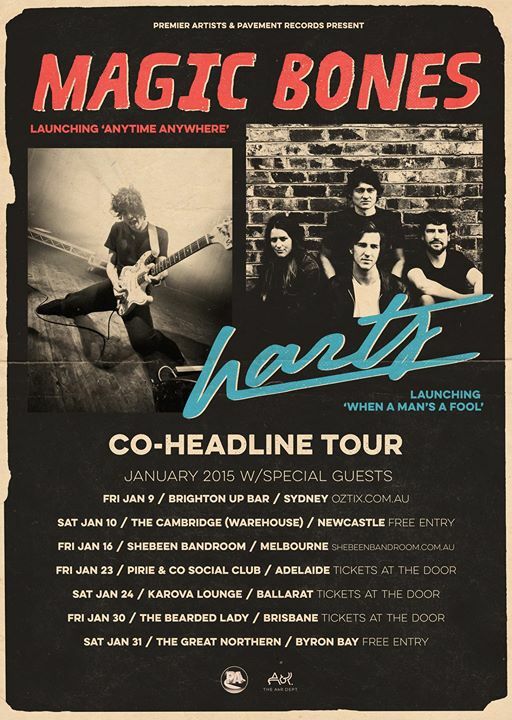 They will all continue on their travels and adventures around Australia and other places. Norie from Japan was next to graduate. Her teacher said that she had perfect grammar and a very confident speaker. 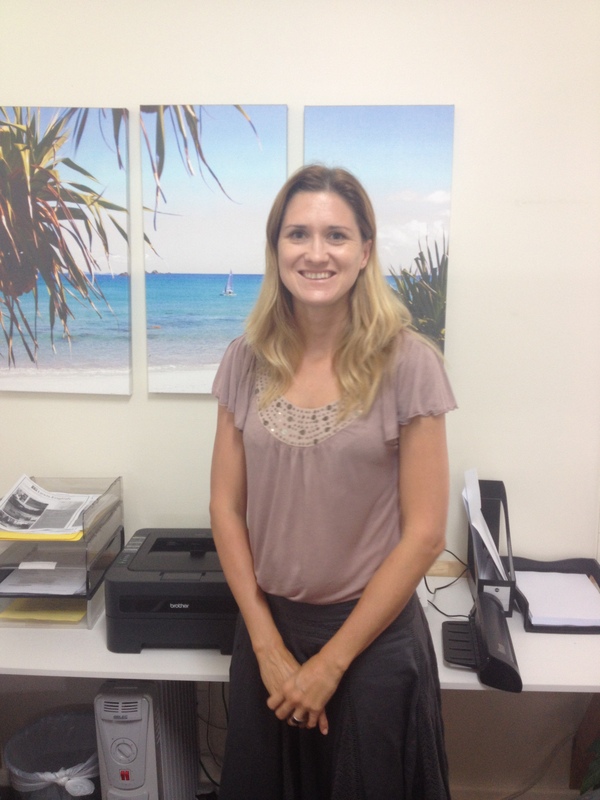 Norie said she enjoyed her time here and that she hopes to see everyone again soon! Denise was already a pretty good English speaker but was able to get even better in her short three weeks here with us. She is leaving the school and heading to a week long surf camp! Next was Michael or as many of you know him as Siggy. His teacher said he was a pleasure to have in class and a fun person. Siggy said he enjoyed his time here in Byron and is going to start travelling and is really looking forward to it. Last but not least we have Mario from Switzerland. His teacher said he was a brilliant student and very hard working. He would always ask questions and help other students. Mario said he had a good time in Byron and there were great teachers. Mario is now going to start travelling. Good luck to all our graduating students with their travels and adventures! We have quite a few awesome activities set up for this month as well as a lot of the usual activities. 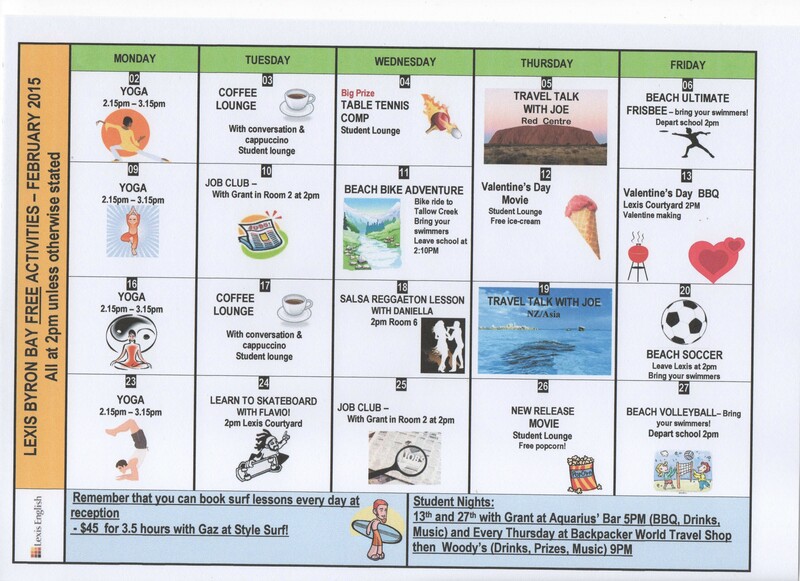 We have yoga every Monday, Beach Sports, Movie Screenings, Job Club, and Coffee Lounges. Joe will be giving a few Travel talks about the Red Centre as well as New Zealand and Asia. We have a Valentines Day BBQ with Valentine making as well as a Valentine’s Movie Screening. New for this month we are having a Salsa instructor come in and hold a dance class for any interested students. 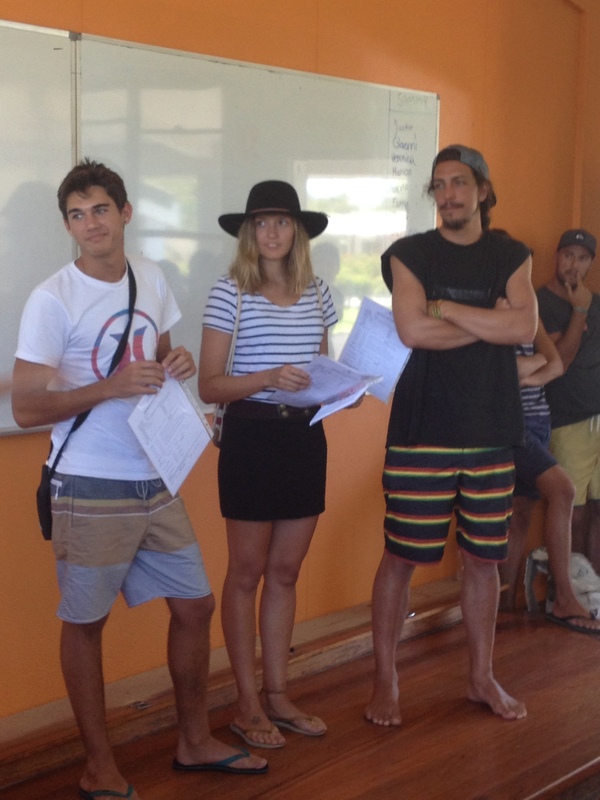 Daniella, the instructor, teaches all around Byron including at the Ginger Pig every week. On the 24th February, Pro Skateboarder Flavio returns from a broken foot to give beginners and experienced skaters instruction, challenges and encouragement. Flavio teaches at schools all over Byron and his classes are always really popular. So don’t miss out on this one. I look forward to seeing you all at the activities this month! It’s going to be a great February! We now will be holding our student nights at Aquarius’ Bar and Grill. 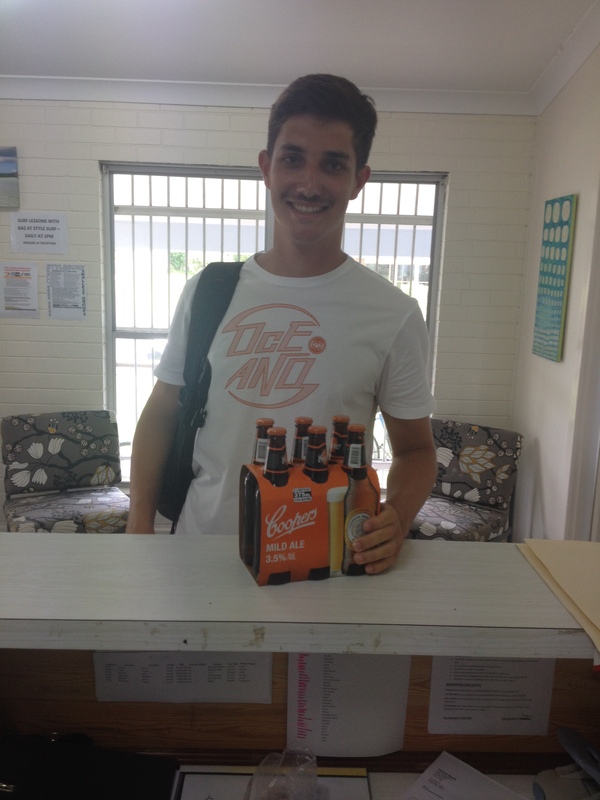 Join Grant between 5PM-7PM Fridays every fortnight. The first 15 to 25 students could earn themselves a free drink. Students will also receive a special guest wristband to earn them discounts on drinks for the rest of the night. If you thought that was all then you are wrong! Students will also receive a voucher for a free BBQ meal with the purchase of any drink! The BBQ will start at 6:30PM instead of 7PM special for the students and then be open until 8PM. Make sure to find Grant and say “hello” and “how ya going?” to get set up with your BBQ Voucher, possible free drink and discount wristband! Still not finished! There will also be live music playing through the night so it’s going to be a good time far past 7PM. So feel free to hang out and enjoy the atmosphere and music all night! Holding out for the Weekend! Welcome everyone to this week’s weekend report! A lot of stuff going on this weekend and we even say good bye to January and hello February. The big thing going on this Friday is our Student Night which will be held at Aquarius.Starting at 5pm and many of the first students will be getting a free drink! More information on it to come. Here we go with a little weather report! Looks like heading into the weekend it will be between 26 and 31 degrees during the day and 18 at the lowest. Partly Cloudy Friday, Sunny on Saturday, and Chance of Showers on Sunday. Claudia is one of our longest standing and most popular teachers and also regularly works as Acting Director of Studies/Campus Manager while Lisa is away. She has been living in Australia for 11 years and came to us from Germany. Meet CLAUDIA everyone! I’ve always been interested in languages. When I was younger I spent a year in Los Angeles at High School, lived in Europe and traveled a lot. Teaching to me seemed to be the perfect choice to combine my interest in languages, meeting new people, getting to know different cultures and having a job where I can actually make a difference in people’s lives. What is Byron’s best kept secret? There are too many to mention them all! But make sure not to forget to visit all the awesome little towns in the Byron Shire. Especially Mullumbimby! And watch the sunset from the lighthouse! It’s a simply stunning experience that you will never forget again! Meeting all these awesome people from all over the world! I love travelling, speak four languages myself and having lots of interesting conversations with my students just makes teaching fun! Travelling around the world with my family! Visiting lots of different countries, trying local food, experiencing different cultures and preferably having all the time and money in the world to do this. J I love showing the world to my children and try to make sure we travel as much as possible! What is your favorite part about Byron Bay? Well, I guess there is so much I love about Byron that I cannot put it down to one thing. I’d say maybe the atmosphere if I have to pick one thing. People are easy-going, relaxed, friendly and conscious. I love that people have an awareness of the world around them and live life to the fullest! What is your top tip for learning English? Be confident, have a positive attitude, socialize with and talk to locals. Immersing yourself in the language is the best way to even start dreaming in English soon!! Here are most of the jobs available this week around Byron. Make sure to keep checking The Echo, Gumtree, and just going out and handing out resumes everyone. Good Luck! Helper wanted for house duties, washing dishes ,spring cleaning , preparing food and meals , making juices etc, washing windows, other light duties, in exchange for all food and accomodation. Work is 2 and a half hrs per day , for your own clean and comfortable room with own bathroom attached, and vegetarian food provided. Can help with second year visa . Tuesday we had a Poker tournament where we played some Texas Hold ‘Em. Ten students joined it and battled it out to be the victor and win the prize. 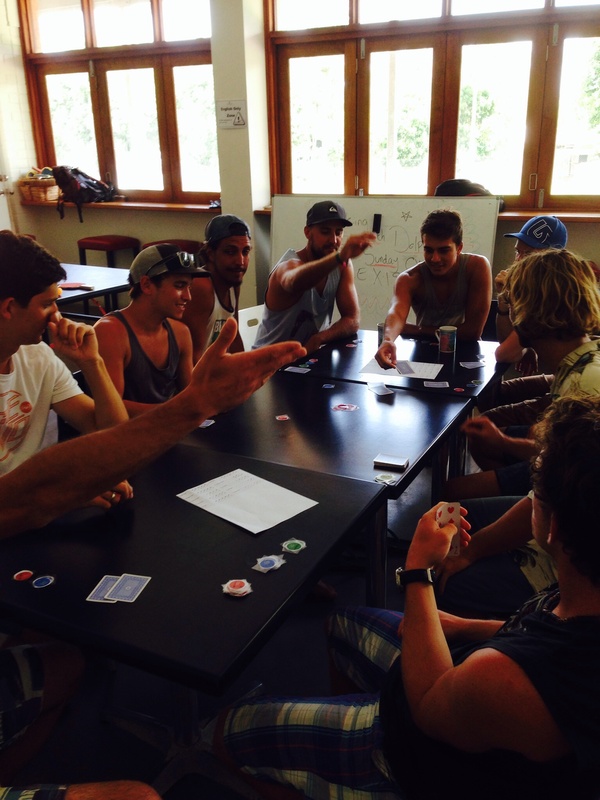 After quite a few hands, and a few students going all in, the table kept getting smaller and smaller. We even saw a student be one card away from a royal flush and instead had a straight flush missing the ace. The final two were Jeremy and Andre. Jeremy was looking to win his second prize of the month since he had already won the ping pong tournament earlier on this month. But Andre was equally keen to win and ended up becoming our poker champion! It was a great tournament and congratulations Andre!! !